"Where is your bedsheet bag?" Once in a while, Pei Pei and Hao Hao mixed up their belongings with their classmates in school. So far, we have been fortunate enough that their teachers found their belongings and returned to us. I had put labels on their belongings, but those labels did not last very long and were peeled off easily. As I was having a headache looking for good quality labels, the nice folks from Stickerkid offered to send some personalised stickers for Pei Pei and Hao Hao! Manufactured in Switzerland, Stickerkid uses high quality material to produce the best possible stickers. 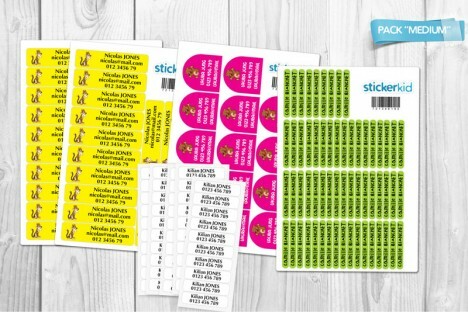 Stickerkid carries a range of products - stickers for belongings (small, medium, large, extra large, stickers for books and notebooks), stickers for clothes and shoes, as well as identification bracelets. The best thing of all, is that we have a say in the design! Together with MaMi, Pei Pei and Hao Hao chose their favourite colour for the stickers, font type, font colour, and logo for bigger stickers! They were thrilled to receive the colourful and glossy stickers! Iron-on clothing labels for bedsheet bags and school uniforms, small stickers for water bottles and stationery, medium stickers for snack boxes, shoe stickers for... of course shoes! In particular, I like the iron-on clothing labels, they are very soft to touch! This is important because children have delicate skin, the labels on the clothing must be gentle to their skin! Do you want to have a set of high quality stickers for yourself or your children? Good news! We are giving away one set of My First Pack (Pack of 156 stickers) worth S$49! This set consists of 32 large stickers, 60 small stickers, 14 shoe stickers and 50 iron-on cloth stickers, and shipping fee is included. The giveaway is open to worldwide readers of PeiPei.HaoHao! Three simple steps to win! The giveaway will be closed on 3 September 2013 2359hrs. The winner will be announced and notified on 4 September 2013. That's not all! From now until 31 September 2013, all PeiPei.HaoHao readers get to enjoy a 10% discount off all Stickerkid products (excluding S$6 shipping from Switzerland to Singapore) - just enter discount code PeiPei2013 when you check out! Disclaimer: We received complimentary stickers for review purpose. No monetary compensation. All opinions are mine. The personal items belong to Pei Pei and Hao Hao. This is awesome! About time someone came up with good quality stickers! I really need to label Poppy's school shoes - almost everyone in her class has the same design! Wow! This is a good giveaway! Thanks for hosting! Hope to win to make for my child! Yeah! Hopefully I can win some and label all their things. Liked both FB pages. Thanks for hosting the giveaway! Thanks for the giveaway.. this is really useful for my kids..
What a great giveaway!! Thanks.